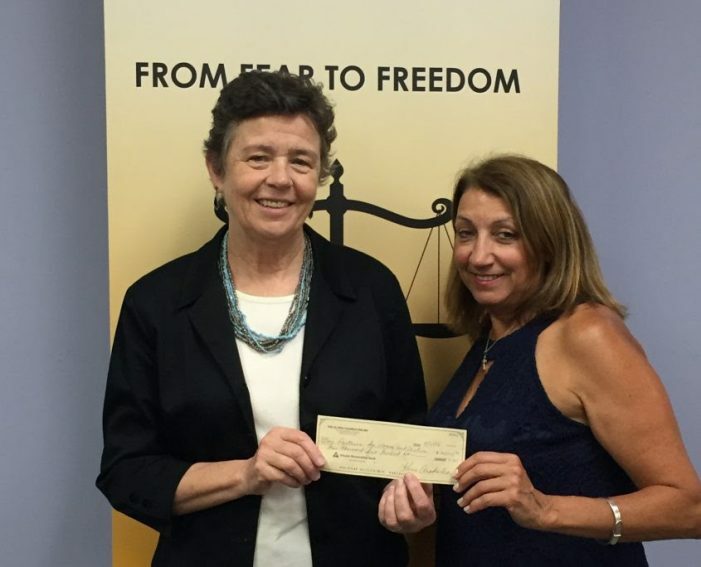 Recently on May 10, the Gloria Foundation of Montville held its third annual fundraiser raising an impressive $30,000 to aid those who are affected by domestic violence. All proceeds went to benefit The Morris Family Justice Center, a domestic abuse shelter for Morris County. Started in 2016, The MFJC is an all-encompassing center where all of the needs of domestic violence survivors are all taken care of in one place: From counseling to protection, to legal services, to children’s services, to whatever is needed. his year, approximately 150 people gathered at the Waterside Restaurant in Bergen County to celebrate and aid the Gloria Foundation in this worthy cause. “I am so thrilled that people were so generous,” says Karen Arakelian, founder of the Gloria Foundation. The Morris Family Justice Center was elated with the money as well. Domestic violence, it is the darkest most awful thing people can endure. In addition to the physical often life-threatening battering the body takes, the psyche, self-esteem and emotions are also battered. And the numbers are staggering. It is reported that of those who are involved in an intimate relationship, on average nearly 20 people per minute are abused! That breaks down to one in four women and one in seven men. Often much worse than a scarred body, is the scarring of the soul. Victims of domestic violence often feel like there is no hope, that they are helpless, isolated and alone. But there is a light at the end of that dark hell. With aid and empowering help, such as the kind the Gloria Foundation provides, the victims of domestic violence transform into survivors—survivors that can flourish and thrive. The Gloria Foundation was established in 2013 with their consignment shop established in 2014. The mission of the foundation is to provide essential resources to local safe houses and domestic violence organizations. The Gloria Foundation was lovingly named after Arakelian’s mother. Arakelian is warm, articulate and passionate on the subject of the Foundation, showing that something good could come out of such horror. And both the foundation and fundraiser was a wonderful way to do just that. It is impossible to put a number on just how many people the Gloria Foundation and The Morris Family Justice Center has helped, but Arakelian asserts that since the MFJC has opened at least over 1,000 people have been aided for the better. During the night of the Gloria Foundation’s fundraiser, there were performers, a silent auction, speakers, a raffle, a DJ, dancing and much more. Despite the fun and celebration, the cause of aiding domestic violence was never far from anyone’s mind. The highlight of the night in Arakelian’s mind was the moving rendition of “Love the Way You Lie,” the Eminem and Rihanna song that her musician son and partner emotionally performed for everyone.